Notice the family resemblance? For Sony's latest Android tablet take, its Xperia Tablet Z, the company's extending the austere, omnibalance design (focus on all around symmetry and reflective surfaces) and waterproof certification of the Xperia Z to a 10.1-inch footprint and higher 1,920 x 1,200 resolution. Which means the unique, highly polarizing magazine-like fold of its predecessor, the Xperia Tablet S, has fallen by the wayside and, according to Sony, it's not likely to ever make a comeback. But a cosmetic evolution isn't all that's propping up the Xperia Tablet Z; its lightly-skinned Jelly Bean OS, quad-core 1.5GHz Snapdragon S4 Pro CPU and 2GB of RAM ensure above average performance for this Sony tab. So how does this Z of another frame fare? Follow on, as we take it for a brief test run. Sony claims the Xperia Tablet Z is the world's thinnest and lightest tablet; a boast that carries weight when you first grip the tab. At 495 grams (17.5 ounces), the 6.9mm-thick tablet barely registers in your hands, at least when compared to heavier efforts that have come before it. And that lightness is especially necessary for this Z given the not quite ergonomic feel of its borrowed form factor. There's a slight sharpness to its water-proof frame (which also houses the 6,000mAh battery and NFC chip) that could've proven irksome had this tab been more substantial, cutting into your palms and making prolonged usage a nuisance. But, thankfully, that doesn't appear to be the case. So, that's the plus-side to its construction, but there's a con hiding in its blend of polyamide, tempered glass and matte, graphite back: fragility. 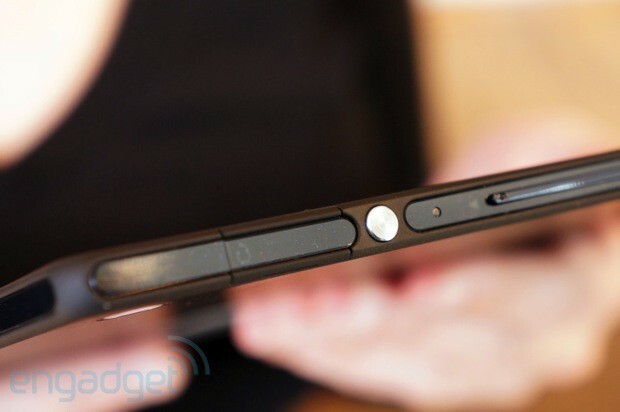 Exert some slight pressure on the Xperia Tablet Z and you'll not only notice it bend, but you'll also hear it creak. Additionally, this has the unfortunate effect of slightly distorting the LCD panel -- an imperfection that can even be triggered by a heavy press on the bezel. It doesn't augur well for the slate's durability, especially when you consider this is being positioned as a living room companion. 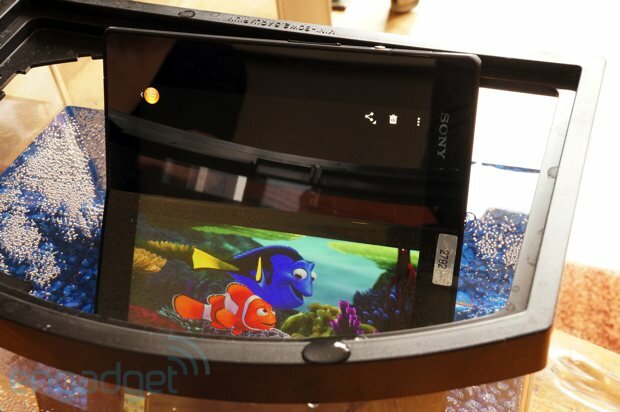 Which brings us to the crux of the Xperia Tablet Z's conception: its extended TV capabilities. Pre-loaded onto the slate is TV SideView, a Sony app that builds up on its Watch Now visual programming guide and inbuilt IR blaster to give users live show scheduling, recommendations, voice search, remote control, as well as IMDB-like cast and crew info (furnished by Gracenote). By sliding, or "throwing," a selected program at the flatscreen, users will be able to change the channel without having to reach for the remote. Users with more complicated home theatre setups will still have the option to program macros using a separate, pre-installed remote control app or make use of the dedicated MHL port for video out. The Xperia Tablet Z's performance, on the other hand, offered up nothing but positives in the short time we spent with it. Thanks to a healthy amount of RAM (2GB), that S4 Pro and Jelly Bean build (4.1.2), the tab had no problem briskly swapping between the home screens and app drawer and even loaded up selected applications with a snap. Of course, we'll need to properly benchmark the tablet to get a real sense of its raw performance. For now, though, it appears this Z is more than competent. Along with the signature design that Sony's carried over from its current mobile flagship, the Z, comes a similar (though somewhat lesser) focus on enhanced imaging. The company's chosen to stick with its now penultimate sensor, the Exmor R, for this slate's 2.2-megapixel front facer and 8.1-megapixel rear cameras. Lack of HDR video notwithstanding, users will still be able to take advantage of the souped-up camera software (a Superior Auto mode that shifts based on ambient surroundings), HDR (for stills) and lowlight performance. If you like the looks of Sony's sophomore Xperia tablet effort, you'll have to practice some patience -- it's slated to ship globally sometime this May. When it does finally hit retail, you'll be able to grab the black model in both 16GB and 32GB configurations at $499 and $599, respectively. An all-white 32GB model will also be available, but only as a Sony store exclusive.